Canada’s Montréal-Trudeau Airport­­­­­­­­­­ (YUL), just like Toronto Airport, is now utilizing automated baggage handling from Materna intelligent passenger solutions (ips) ready to meet the needs of substantial increases in passenger numbers. 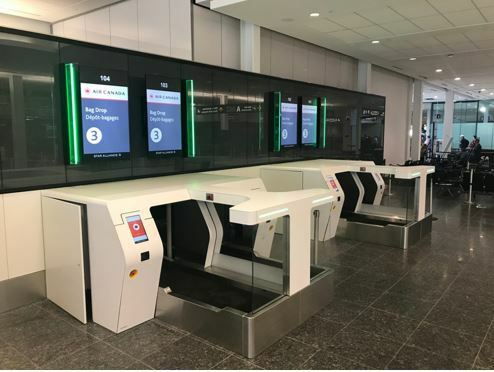 A total of 16 self bag drop kiosks have been in operation at YUL since November 2018. Materna ips installed the solutions and is also providing operational support for the next three years. For the German IT services provider this self-bag-drop project in Montréal is another big step in the context of its activities in North America, and in Canada in particular. The new check-in area in the terminal building at Montréal-Trudeau Airport delivers a much-improved passenger experience with its 16 new self bag drop kiosks, positioned as a self-bag-drop island. Utilizing a 2-step passenger process, passengers now print a bagtag at a check-in kiosk and move directly to the self-bag-drop, decreasing process times tremendously and increasing the passenger travel experience. The new self-bag-drop system fits perfectly into the airport environment and its exciting design has impressed everyone. Materna ips took just 10 weeks to implement the self-bag-drop project. The innovative Air.Go solution from Materna enables Montréal Airport to achieve more effective passenger handling and is a key step in handling the challenges of rapidly growing passenger throughput numbers.